Brought to us by Pordeecam Production team, Wun Nee Tee Ror Koy (The Day I’ve Been Waiting For) is a remake of Bird Thongchai’s lakorn 20 years prior. Headlining our Wednesday-Thursday timeslot from channel 7 is actor Om Akapan (as Prince Nanping Norathep and Jao San (Khun Chai Yai)) and Chat Pariyachat (as Marn Fah and Prali (Bri)). 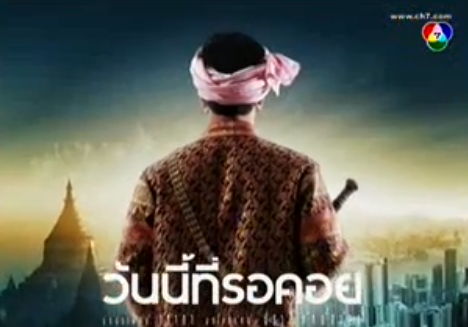 This is an action drama, based out of Kiriratnakorn, but also takes place in Hong Kong. The premise surrounds the events that led Prince Nanping Norathep to flee his country as a wee boy, and his journey to return back to the throne as a grown man. The Day I’ve Been Waiting For not only attests to that dream, but also pertains to a romantic enthrallment of a man who has been waiting for his love. Should be an interesting one, and they’ve commissioned P’Bird to sing for the OST? Aw. It is desperate times in Kiriratnakorn, a young prince watch in horror as his mother, the Queen collapses without reason. His father, the King, has a sense of urgency, he comforts the young child that his mother is only out for a spell. His Highness pushes a royal seal into the boy’s hand and makes him promise to guard it with his life. The trusted right hand man scoops the queen in his arms and is ordered to leave. With his last words, His Highness orders his son to be a strong man when he grows up. Nanping Norathep, the said prince, forces his feet to move, but as he glances back at his father, the King is collapsed on the floor from a suicidal, poisonous drink. We are in Hong Kong. 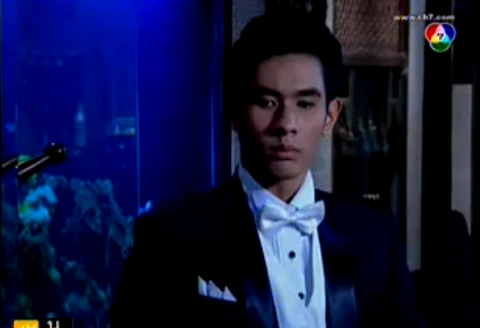 Norathep now known as Jao San (Khun Chai Yai) has grown up. Clad in a handsome black suit, he speed races on a sailboat to aid his adopted brother, JinJiang, who is clad in an all white suit. (Nice contrast between the brothers.) JinJiang is elbow deep in a drug exchange; when he realizes that his supplier double-crossed him with inauthentic cocaine, all hell broke lose. It is two against several, until Jao San appears and saves the day. Jao San scolds JinJiang to get involved with the family business, not immerse himself with illegal activities. But the younger man pays no heed to the law nor his brother’s reprimand. Already we have a familial conflict! Jao San’s benefactor Tae has passed away, now he has to deal with the heir of the Jao’s family, who is completely at odds with him. Jao San dusts off his fighting skills to enter a church where the Reverend gives him special permission to use the premises for a very important meeting. Come to find, Pu Sin Thorn, the trusted right hand man who had escorted him from Kiriratnakorn, has undergone complete facial surgery and unrecognizable to Jao San. The older man kneels and offers respect to his Prince, and Jao San flashes back to the time he fled his country with the man’s help. Pu Sin Thorn reports some crucial developments in Kiriratnakorn, that his cousin, Prince Sikornirodom is en route to neighboring country as a means to establish his allies. Jao San had been the one to contrive for Prince Sikornirodom to visit Hong Kong after his trip to Thailand. Pu Sin Thorn had an inkling that Jao San was behind it, but feels that it’s too risky because the baddie is using this trip as an excuse to eliminate the missing prince. Jao San is determined to reclaim his throne from his uncle but believes that his cousin is only a mere puppet behind his father’s reign. Jao San misses his mother so and says he is ecstatic to be seeing her soon. He sends his regards to his mother with Pu Sin Thorn, and that Marn Fah has arrived- we flash back to a couple who saved the queen. They begged the queen to take their daughter under her wing. The queen promises to raise her as one of her own. The aforementioned woman is called Brali, who has arrived in HK airport and she learns that she’ll be holidaying in HK alone. Immediately she dials her father’s number (and we know that he’s not her biological father) and wants to return to Bangkok. But her father has it all planned out for her, he reports that his “friend” would be taking care of her while she’s in HK and that she should visit HK to her heart’s content. Jao San wants to ensure that this very special guest arrives to HK seamlessly. He could not pick her up from the airport, which sours his mood to no end- because through another flashback, we see the young prince sending his childhood friend off. She has been given a new life, family and future. He says to his mom that no matter how long, he will be waiting for that day- the day that fate will bring them to meet each other again. The adult Jao San remembers that day clearly, as he anticipates their reunion. 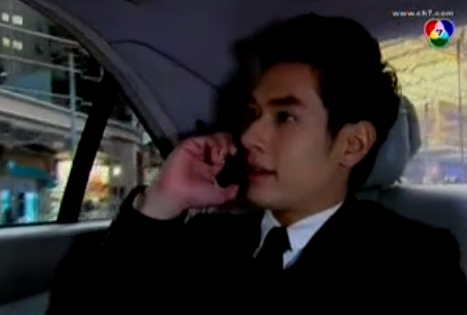 On the car ride to the hotel, Brali (Bri) is told by Ali the driver that Master Jao San will be meeting her after work. She inquires what kind of work he does, but Ali is very vague. Saying that he sells things, but not offering any details. But clearly he’s a powerful man because even the five star hotel manager comes out to greet her upon her arrival. 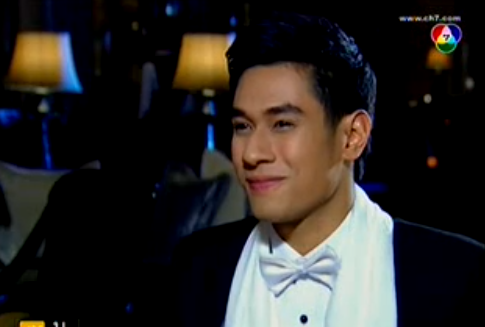 We then get introduced to the other players in this lakorn. 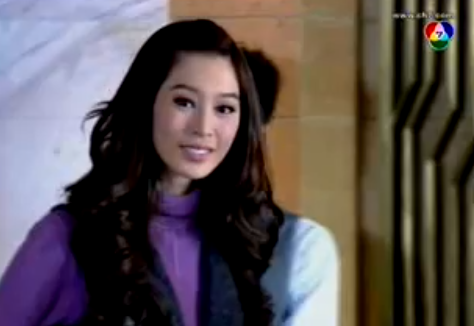 Meiying calls our leading guy “P’Chai Yai” and she’s part of the same Jao household as he. She is obsessed with him and wants to know what he’s doing and where he’s at, at all times. We can tell she’s going to be the insufferable one. She invites him to join a ballet performance with her this eve but he declines, saying that he had other matters to attend to. Which irks her because later she finds out that he purchased a sparkling black dress from Louis Vuitton for someone other than her. Even though Bri was told to stay put until Master Jao San came to see her, she’s not one to sit still so she decides to frolic in HK alone. Walking on the streets she notices HK fashion meisters and asks to take a picture of them. Ping An had noticed Bri earlier and admired her fashion sense as well so they became fast friends. How, convenient. It turns out, Ping An also belongs to the Jao household as well, because as they were shopping, they literally run into Jinjiang who is immediately smitten with Bri. He rudely takes her hand to shake it and tells her that he has met many Thai woman, but none as pretty as her. Bri finds him strange and rude and peels her hand way, telling him that she haven’t met an HK man who treats her the way that he does. Ha. Creepazoid. There is an introduction of serious family conflict and competition. There are four houses that belong to the Jao’s and the head mistress is Mae Yai (big mom) and Jinjiang claims that since he’s the biological son of Tae, he will usurp all of the properties anyway (he’s just waiting for Mae Yai to perish, and that Meiying should start looking for a new place to stay.) These two don’t like each other. It’ll be interesting to see how they tear each other’s eyes out. He tolerates Ping An, probably because she’s docile and un-witchy like Meiying. Also probably because he wants to know who her new friend is. This new friend finally returns to the hotel where Jao San waits for her. He’s been anxious since he came back to the hotel to find her gone. He heard that she is a feisty one so he thought she got pissed off at him and toured HK on her own. The moment he spots her however, his heart races and he spins around so she doesn’t see him. He follows her into the elevator where he nonchalantly asks her what she thinks of HK so far. Probably thinking that he’s being a nice employee at the hotel, she replies that the weather is nice. She then finds him a little strange because he knew where she’s been visiting (which he attributes to the name brand shopping bag she’s carrying) and he follows her to her floor. Much to her chagrin, she learns that he’s the Master Jao San, her father’s friend. What a young friend. She didn’t expect that- nor did she like that he’s so bossy. He orders her to get ready for this evening, he has much plans in store for her. Jao San goes to see Mae Yai next who warns him not to trust anyone, especially Jinjiang because she knows he’s just waiting for her to die. We know she’s on his side when she reminds him that he’s a Jao as well, and he ponders this disturbing comment from Mae Yai in a hot tub and while he’s dressing up for the evening. She warns him about the value of the house, that he cannot sell it or get rid of it. Jinjiang wants to turn the house into a casino. That evening Bri receives a package from Jao San- and I cringe every time I hear her speak or read English- the letter says “could you please accept this evening dress I hope you will not regard this as a sign of contempt your father knows me well” (there is no punctuation and plenty of grammatical errors). She smiles at his thoughtfulness and puts on the sparkling black dress- taking Jao San’s breath away as she walks down the stairs. Standing before him, she gets a flash of a young boy consoling her not to cry. Jao San calls her name to get her attention, as her mind was drifting, and Bri thanks him for her dress, for everything. She thinks he has seen her before because he was her dad’s friend and Jao San just goes along with it. Heh. He takes her city gazing and is completely smitten by the fact that he’s finally with her, that he can finally meet her. He asks if she would like to go anywhere else and Bri wonders if he’s that free and what he does for a living. “Are you a mafia?” she asks. Lol. Could you blame her? He replies that he’s a businessman and she wonders if it’s legal business. He just smiles, pleading the fifth. They dine next and he gets to know her a little more. She had been studying in LA (with horrible English apparently) and isn’t used to the time difference yet, so she barely have an appetite. “What about you? Have you lived here long? Don’t you miss Thailand?” she asks him in return. Jao San explains that he has to deal with businesses here and it’s not yet time to return. Bri teases him that a flight to Bangkok is only two hours away, assuming that is where he’s from. Jao San tells her that if he visits Bangkok one day (that he’s not originally from there) he would like to visit her. She tells him she would be happy to take him around. The man just smiles at her and she keeps getting flashbacks of a boy’s face who has that same smile. “Have we met before?” she asks. But don’t you hate it when someone asks you a question, but immediately answers for you that perhaps they really haven’t met you before, that they’re just familiar with your face? Bri does that very thing. Jao San reiterates that he’s known her since she was a kid- even since she was in her cradle. Bri admits that at times she has memory issues or brain malfunction because she can’t remember certain things. Some of her past gets muddled and appears like a dream, and she always tries to conjure up those memories to no avail. Meiying happens by the same restaurant and sees her P’Chai Yai dining with another woman. The action is picking up because as expected by his bodyguard, who stalks him even when his boss tells him not to, the baddies are after Jao San’s life. It seems every corner he turns, hired hands are there to kill him. Back at her hotel room, Bri questions how Jao San has met her since she was a baby. She wonders who he really is and googles him. Lol. I would totally do the same. Jao San doesn’t get a restful night even at home because Meiying is ready to accuse him of seeing someone else more important than her, taking the girl out to dinner, buying her expensive dresses. But Jao San wonders why she didn’t show herself at the restaurant, he would love to introduce them. Ha. This sort of blows her top off. She is frustrated that he doesn’t consider her feelings. Jao San speaks to her nicely: “I always understand your feelings Meiying, because you are like my younger sister. We grew up together. We use the same name. That can never be changed.” Oof. Meiying doesn’t agree, because he’s not a true Jao (i.e. not her real brother.) Jao San explains that he can do everything to repay his debt to Tae, even sacrificing his life. But when it comes to matters of the heart, he asks her not to force him. I love Jao San! But Meiying gives him another reality check. She tells him that they need to work together to thwart off Jinjiang who is damaging the company’s profits. She resented the fact that Jao San gave Jinjiang the Tai Peng title. Dang, Tangmo is such a great actress. She carries that heart wrenching, crazy, I love you one-sided character so well. I wish she was the nang ek! I might find myself rooting for the crazy bad girl after all, even when I know how things will end for her. In his room, Jao San thinks about the past again, remembering the training between his father and uncle. Then he recalls a time where he was given the opportunity to give a baby a name. He decided on Marn Fah, and the rest, as they say, is history. Present time in Kiriratnakorn, Prince Sikornirodom is training his martial arts. He seems sweet and docile, the same little boy that Jao San remembers him to be, someone who is not capable of thinking ruthless thoughts like his father. He’s not a bad looking fellow either. He’s reminiscing that it’s been 20 years now since his cousin has been missing from Kirirat, he believes that his cousin was taken from their country. He seems to miss and love his senior very much. Mitila teases her brother, Asunee who’s the royal guard, that he’s not capable of protecting the prince. She thinks she can do a better job- ha- and the Prince humors her by agreeing to a sparring. When she makes eye contact with that kind face and teasing smile, she immediately blushes and tells him that she doesn’t dare be (that) rude. Ha. Jinjiang confronts Jao San about his new business acquisition. Right. in. front. of. everyone. Do they not care if employees gossip? With a Tai Peng like Jinjiang, it’s no surprise they are going downhill. Jinjiang especially didn’t like the fact that Jao San didn’t ask for his advice or call a meeting- that he determined everything on his own. Fortunately a levelheaded Theresa, probably Jao San’s assistant, asks them to have their “discussion” (blow out is what we should call it) in a conference room. Jao San tells him to cool down, that Jinjiang’s position is Tai Peng because he’s the rightful heir. As for Jao San, he’s merely an orphan that Tae took under his wings. Jinjiang claims that Jao San is not helping the Jao family at all, he’s taking them down. And the ending this episode could have been done with a better cliffhanger, as a way to keep the viewers invested. The main players have been introduced, the backdrop and story has been set up. I didn’t quite care for the beginning action scenes, it made me dizzy, but as the episode progressed, it got marginally better. The flashbacks are ways to include the past without having to start linearly, but I think with too many flashbacks it can also take the viewers away from the story. Less is more, show. I always like the story of a pr’ek who bonds with a n’ek from a young age. It sets up an awesome (potential) chemistry when he sees her again, fawning after her. With that being said, I’m not feeling the chemistry between Chat and Om yet, and I find Chat to be a bit stiff. The conversation during dinner should be compelling, especially when she’s admitting to him that she has memory issues. I felt she could have done a better job engaging me at least. We barely got scenes of Prince Sikornirodom but I’m finding myself more in tuned with his character. The fact that he’s such a kind person, yet incapable of ruling a kingdom in the future (as evidence from his father’s puppeteering) which will set up for some angst-y pitfalls down the road. I also found his chemistry with Mitila very cute and curious about their love story. I also found the bodyguard, Asunee quite endearing and I want to see him continue to stand up to his greedy father. I liked how they aren’t making Jao San and Prince Sikornirodom look identical like the old story. They are cousins yo, they shouldn’t look like twins. I’m sure there was some sort of twist in the old story, but I forget, which will be nice if there are any pending twists in this version, I will be pleasantly surprised. I do have a bone to pick with Jinjiang’s portrayal in this version. Got Jakrajang played him 20 years ago, and he brought out the compelling bad guy. A man who is bad because he has his own ideals and motivations, however, he made being a baddie seem so cool. You sorta want to root for him. I remembered being tied to the tv every time Got showed up- it put him on the map too- so I am disappointed how this actor played Jinjiang. I don’t want to hate you. I want to love to hate you. Understand? Tangmo is so good as Meiying. Like I said earlier, I’m probably going to be shipping her, unless Chat does a 180 and impresses me. Oh, please have chemistry between our leading characters. I’m rooting for you, show. Because I may just do the unthinkable and drop you, should you leave me hanging. 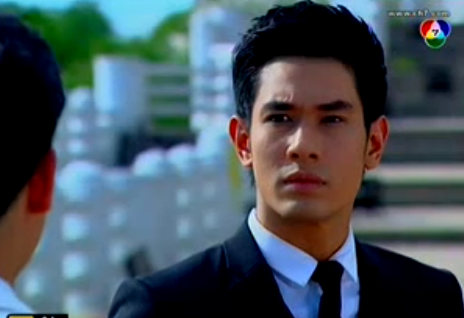 Thank you so much for recapping this lakorn! I love Om:). 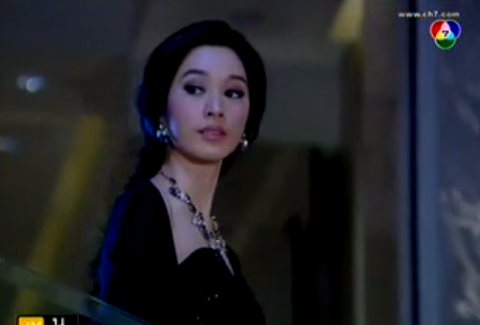 I hope someone will English sub the lakorn! Have a great day! Thank you so much for the recapping and I hope you will continue to do so. Thanks for recapping. You are doing a great job. I loved this lakorn when I was younger. I will wait for a few more of your recaps to determine if I should watch it or not. Same with me. I loved the version with Bird and Ann S. that I don’t know if I want to watch this or not. I like Om he is a cutie but I am not feeling N’ek. I was hoping someone with more experienced to play Brali’s role. Thanks for the recap. Where can we watch this movie at? If you go to this page http://lakornsworld2.blogspot.com/p/in-progress-active-subbing-subbing-has.html than scroll down to inactive projects you will find the movie with two links that will take you to watch the drama. Thanks everyone. As always for ch.7, watch at your own discretions. @ Linda Lor, I watch it on dootv, as ch7 dramas are not available on youtube. I’m not sure if anyone is english subbing this though. I can’t believe it’s been 20 years since the original! Waan Nee Tee Ror Koy was the reason why I got addicted to lakorns. I remember the very day I watched it too. I was being disciplined because I broke a valuable vase. Being that I hated to sit still, my mom forced me to sit and watched the lakorn with her. I was hooked ever since. When I was a teenager I was able to watched the reruns on vhs. VHS! Gosh is that thing still around?! 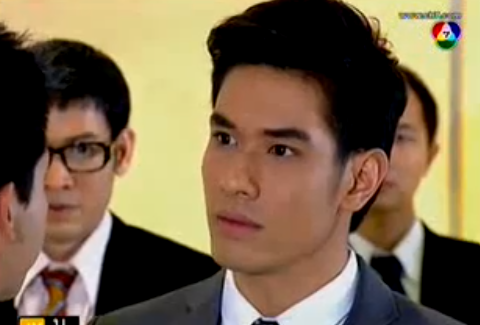 I love the ost and the acting of the pra’nang but what I hated was that they made Jao San and Jao Noy identical. It was a bit confusing for me. Like you Fia, I am so thrilled that they did not in this remake. My feeling with this remake is not as positive and I didn’t expect much either. I never thought much of Om and Chat’s acting. I never really got into Om like others. Jao San in here isn’t as strong and doesn’t exert that confident authority figure like the previous. Brali isn’t as bubbly either. Maybe it’s because of Om and Chat. However I am shipping Jao Noy and Mitila’s pairing and can’t wait to see their relationship blossom. Hopefully this doesn’t turn into a typical channel 7 lakorns that deteriorate as we go and drags to the point of ridiculousness. Where can I find this lakorn? I’ve been looking for it for over 3 years and only managed to find up to ep 10.
where do I find this lakorn with eng subs? thanx.